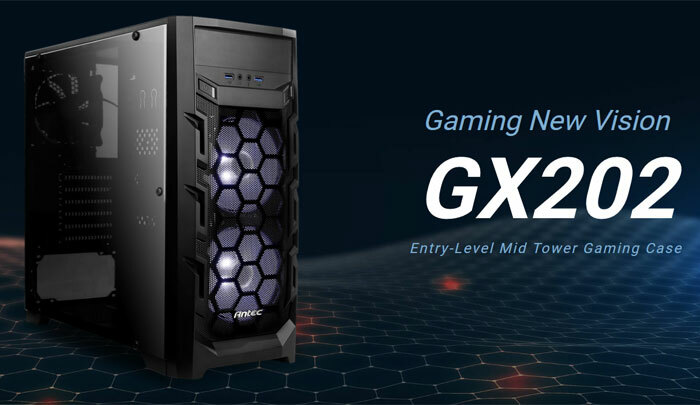 Antec has launched the GX202 entry-level mid tower gaming chassis with immediate availability. Before we go any further it is worth mentioning that headlining quality, the price, which is an MSRP of US$44.99. For the money you get an SECC and Perspex constructed mid-tower with a detachable mesh front with twin pre-installed white LED fans in the front (and one black fan in the back) plus convenient I/O panel on the upper front face. For those that cling on to the requirement of a 5.25-inch front bay (for ODDs, sound card control panels etc) one is present here just above the I/O panel. 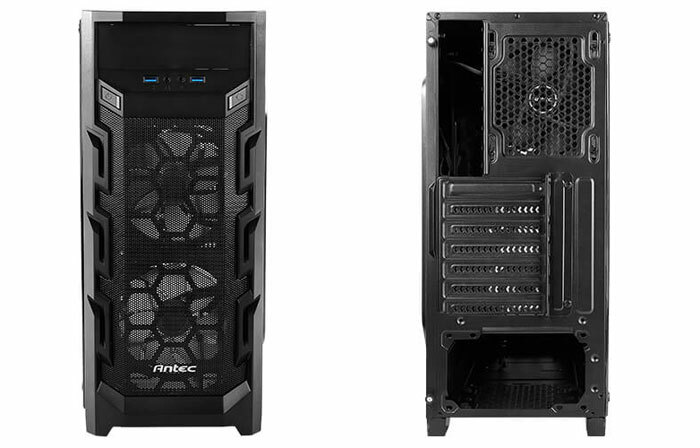 In an email to HEXUS, Antec said that the chassis' rugged exterior was complemented by its styling, cooling features and expandability. 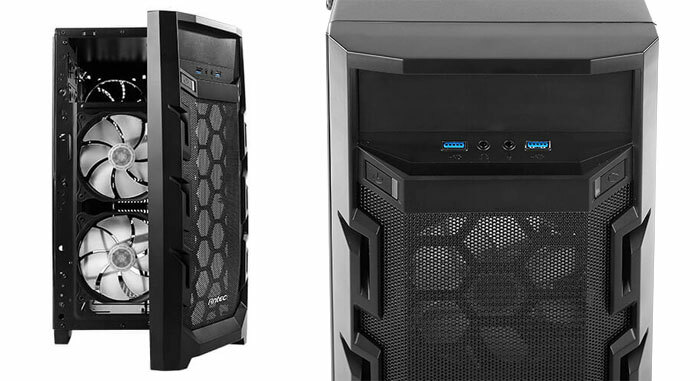 Antec says the mesh front panel is detachable for greater airflow as is the detachable dust filter at the bottom. If your cooling needs go beyond the included 3x 120mm fans there is an option to fit a 240mm radiator. Inside the 450 x 205 x 435 mm (DWH) chassis there is room for ATX, Micro-ATX and ITX motherboard formats, a 5.25-inch ODD, four 2.5-inch SSD drive cages and three 2.5-inch SSD / 3.5-inch HDD drive cages, VGA cards up to 375mm in length, CPU coolers with a maximum height of 160mm, as well as power supplies with a maximum length of 200mm. Seven expansions slots are available. For user convenience the front panel I/O includes two USB3.0 ports, power button, reset button, and MIC/HD AUDIO jacks. Once your build is finished, you can see its inner workings via the transparent left side window. Meanwhile, the right side panel is convex to make cable management easier. That's not a bad offering, reminds me of the old Chenbro gamkng cases. It's a simple case and the pricing is perfect, nothing obnoxious here and there, just simple and I like it. It looks to be doing a lot right. Looking at the official page, it appears the expansion slots even have proper screws rather than being snap-off, a big plus I feel. A Fractal define is ~12kg net weight. Even if we pretend the Fractal had a perspex window and knock 2kg off that's still 10kg. And the Define isn't that much bigger either, these are both full ATX cases. The old but still solid Antec 300 weighs almost twice as much at 7kg.